please excuse our dust while we revamp the website. We think you’ll like the changes! Often called diamonds of the culinary world, truffles are edible fungi that grow underground, and are considered to be a delicacy because of their intense and unique characteristics and aromas. Truffles are often shaved on top of food prior to serving, but they also are used to infuse flavors into dishes. Along with caviar, saffron, and matsutake mushrooms, truffles are considered one of the most highly sought after, rare, and expensive foods in the world. Truffles are the fruiting bodies (spore-bearing mechanisms) of underground mushrooms. The actual fungus from which the truffles grow are formed by an underground network of mycelium in a symbiotic relationship with a host plant. This mutually beneficial arrangement occurs when the fungal mycelium and the root cells of the plant grow together to create mycorrhizae. The plant provides sugars to the fungus through photosynthesis, and the fungus provides the plant with minerals, water, and other nutrients from the soil that it could not get by itself. Unlike mushrooms above ground, truffles rely entirely on animals to eat them as a means of spore dispersal. That is how truffle fungi spread and reproduce. And how do they do that exactly? Well, by smelling good of course! As truffles mature they develop odors and send off gasses and pheromones that signal to the surrounding wildlife that there is something tasty hidden under the soil. We like to eat them for the same reasons a chipmunk might. Are there many types of truffles? Yes. 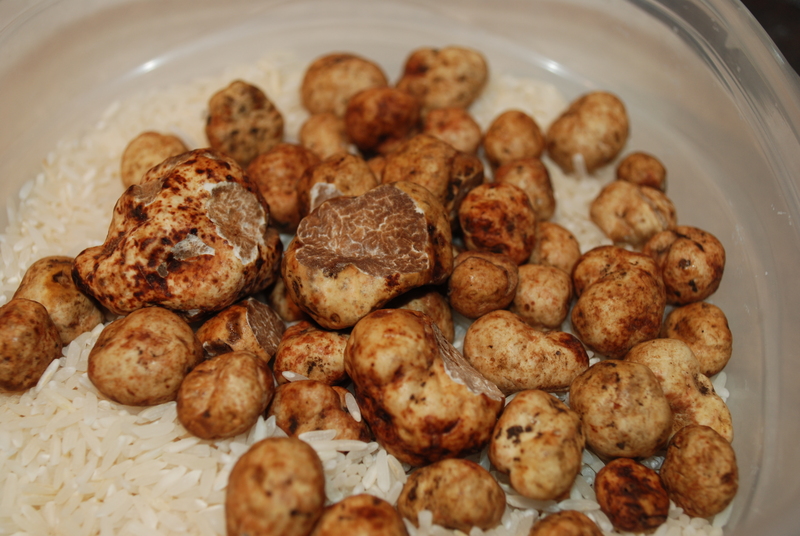 There are many species of truffles, however, only a handful are of commercial culinary value and taste very good. Truffles are found all over the world and are usually associated with certain families of trees such as Pine, Oak, Hazelnut and Willow; although almost any tree can form mycorrhizae with truffle forming fungi of some kind. Depending on the species of truffle and environmental conditions they can be found erupting through the soil or up to 12 inches (or more!) underground. 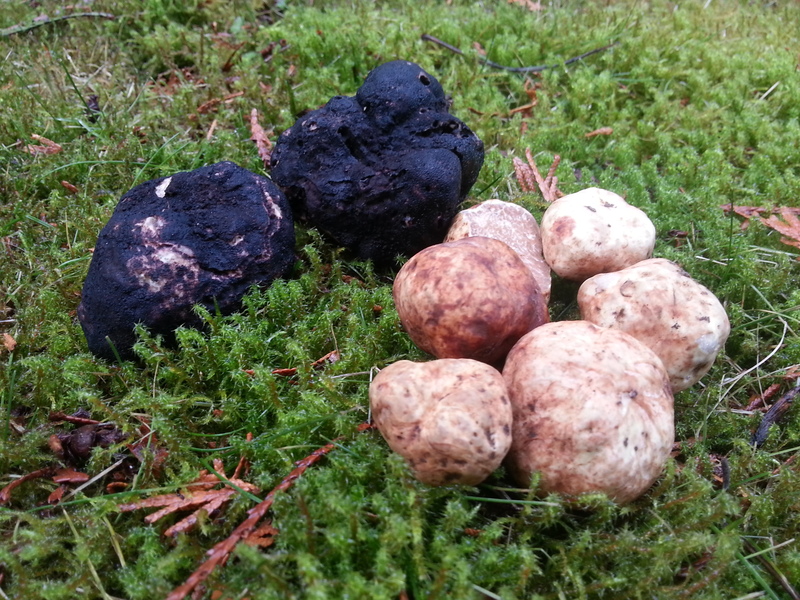 In the Pacific Northwest region of North America, three of the commercial culinary varieties of truffles grow in association with Douglas Fir (Pseudotsuga menziesii) in coastal forests and timber stands. The main growing season for commercial culinary species in the Pacific Northwest is winter through spring. Different species of truffles, such as some of those in Europe will be ripe at different times of the year. How do you harvest truffles? As truffles are usually found underground, you have to have a way to gather them! This is where detection animals come into play because of their superior olfactory capabilities. Traditionally in Europe truffles were harvested by female pigs because the volatile compounds ripe truffles release are similar to pheromones emitted from a male pig. These days however dogs are used because while they have to be trained, they do not eat the truffles as readily and are much easier to manage. A 400 lb pig is slightly more cumbersome than a 40 lb dog! Sadly, in the United States, truffles are also harvested using rakes which can be detrimental to the environment and the domestic truffle economy. What’s the deal with pigs? Pigs naturally forage and rout (dig for food) in the ground with their snouts and are keen lovers of truffles themselves and will happily gobble them up if not trained to eat something else as a reward. Pigs were traditionally used in Europe to hunt for truffles because they can detect truffles at great depths, and required little to no training. In some locations using sows is still the preferred method, however the popularity and ease of use of hunting with dogs has taken precedence over the last century. Raking for truffles is the act of raking the soil of a forest to expose truffles, and then collecting them. This method, used regularly for scientific collections, often yields unripe and immature specimens which may not be suitable for culinary use. 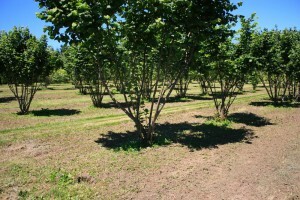 Destructive or aggressive raking damages the ecosystem from which the truffles are removed and also negatively impacts the truffle economy, devauling the quality and reputation of the truffles. Raking can damage other unripe truffles that are not harvested by dislodging them from the support network with their host trees and thus ending their maturation process. Why not, we say! Properly utilizing dogs (or pigs) for locating truffles is more gentle on the environment (and we think more fun!). Unripe truffles lack odor, and therefore don’t have much culinary value. Using dogs allows us to find only the ripe truffles with their amazing aromatics, thus preserving and ensuring optimum culinary value. Dogs also pinpoint the location of ripe truffles and thus less of the environment and fragile duff layer of the soil is disturbed when collecting. For many of us dogs are also part of our daily lives, and live with us as pets. Dogs have amazing olfactory capabilities that far exceed our own, and most dogs thoroughly enjoy scent games. Truffle hunting with dogs is a natural and fun way to enjoy working and playing with your canine family member. Can any dog find truffles? We like to say that almost any dog, and any breed, with the right training, can be trained to find truffles. It is more about individual personality and how you work together as a team. 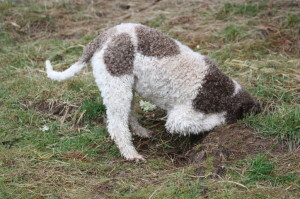 You don’t have to have a Lagotto Romagnolo (the traditional Italian truffle hunting breed) in order to be able to train your dog for truffle hunting. No breed, or mixture thereof, is off limits. We have trained or worked with Chihuahuas, Corgis, German Shepherds, Labs, Spaniels, Cattle Dogs, Newfoundlands, American Staffordshire Terriers, Great Danes, French Bulldogs, and the list goes on. Most dogs thoroughly enjoy hunting for truffles because we make it a game! Can dogs who find truffles also be trained to find other mushrooms? You bet! You can train a dog to find just about anything. The process is fairly similar when teaching your canine to hunt for other mushrooms. We have trained dogs to find matsutake, morels, chanterelles, and other species. Growing truffles reliably is still considered experimental farming to a degree, but there have been many new advances in scientific methods and theory in the pastdecade. Depending on where you live or want to grow truffles and on what scale, there are scientists andconsultants available to aid you in your endeavors. Truffles grow in association with trees, and in order to grow truffles you need inoculated seedlings. It is a complex science, but there are some folks who are trying, some with success! Different species of truffles will fetch a range of prices at market and price fluctuates depending on a variety of factors. 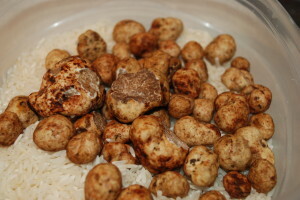 The most expensive species, the “Alba white truffle” (Tuber magnatum) can reach upwards of $2,500/ lb. Truffles are rare, and are notoriously difficult to detect even with the aid of detector animals. This adds not only to the allure, but increases the value. 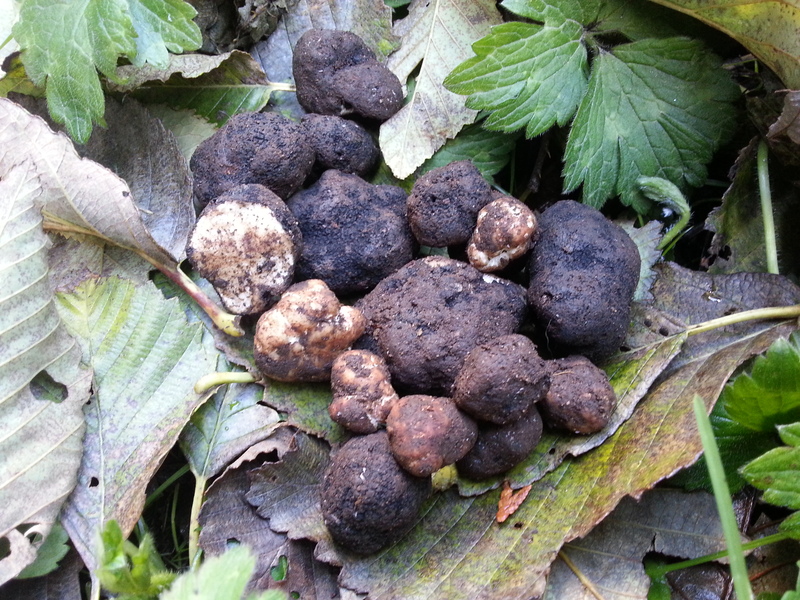 This is one of the reasons truffles are so valuable; they are considered a wild food. Truffle oil traditionally is made from submerging truffles in olive oil. The oil will tatse different depending on the variety of truffle used, and the variety of olive oil, or grape seed oil used. Doing this draws the essence of the truffles out and into the oil. Some who sell truffle oil actually do not use truffles at all and instead inject a chemical compound 2,4 dithiapentane into the oil to produce a similar one dimensional flavor at reduced cost.